Following the successful organisation of the 2015 European Wheelchar Handball Tournament in Austria - the first of its kind since 2008 - the European Handball Federation has set up a working group to put the sport further in the focus. 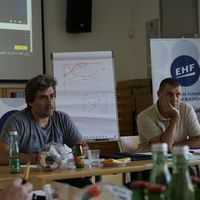 The group met for the first time on Friday and Saturday last week in the EHF Office in Vienna, discussing this year's edition of the European Wheelchair Handball Tournament, scheduled to take place in Sweden in December, as well as suggestions for amendments to the IHF Rules of the Game and the classification of players. According to the amendments which shall be implemented at the 2016 European Wheelchair Handball Tournament goals shall only have a height of 1,60 metres. Furthermore, a team shall consist of five players plus one goalkeeper and - as all teams are mixed - there shall be at least one female player on court at any given time. Regarding the classification of players the working group agreed to differentiate between abled and physically disabled players (not including blind and deaf persons). Only one abled person is allowed to be on court during the match. While this 'easy' classification system is implemented to further promote the sport, it was also stated that future high level events need to have a detailed and strict classification system in place. The meeting concluded with a presentation by Anders Wiiand, project leader wheelchair handball at the Swedish Handball Federation, of the 2016 European Wheelchair Handball Tournament. The event is planned to take place on 7 and 8 December in Kristianstad, Sweden. Four to six teams are envisioned to participate. The federations of the Netherlands and Portugal expressed interest to organise European Wheelchair Handball Tournaments in 2017 and 2018 respectively, should these be foreseen by the EHF. Members of the working group include Jerzy Eliasz (Chairman of the EHF Methods Commission), Pedro Sequeira (EHF Methods Commission), Marc de Sousa (Referee), Bart Neeft (Wheelchair Handball Coach), Danilo Ferreira (Wheelchair Handball Coach) and Anders Wiiand (Swedish Handball Federations).